J'ai perdu mon coeur à paris (I lost my heart in Paris). I have been working in a couple French lessons when I can. I would LOVE to go there someday. I took french classes in high school, so it is coming back to me pretty quickly. I can still picture my teacher up there explaining the how to's of the language. It is funny what your mind will keep up there. I was just thinking that it is something that I want to do: be fluent in another language. I have always loved the french language. I think it is beautiful (très beau). 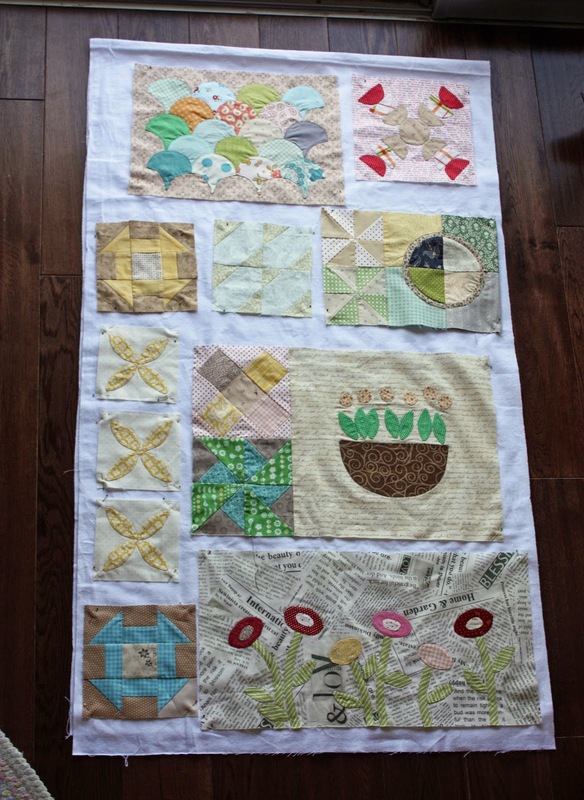 Speaking of romantic stuff… I am making progress on my BOM (if you have interest in this pattern, just click on the label at the bottom of this post and it will link you to all my posts on this quilt). So these aren't the best pictures in the world but you get the idea. My "Design Wall" happens to be to flannel strips of fabric on my floor ;) It works. 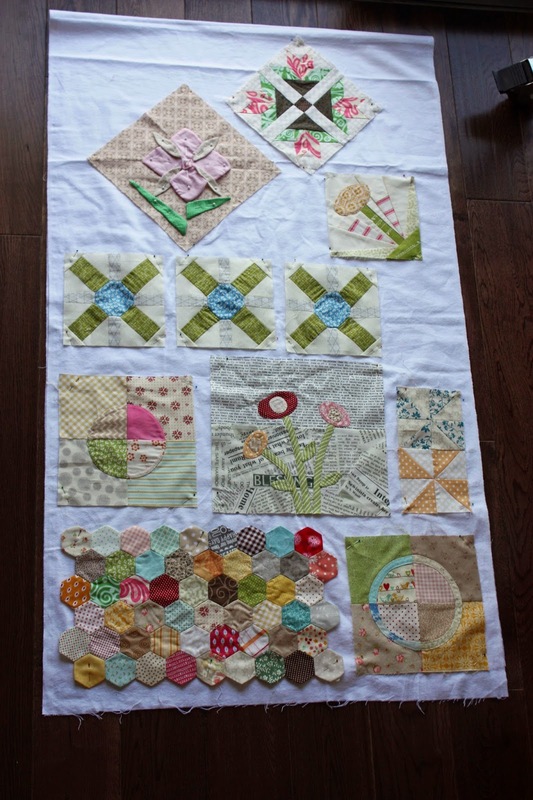 Actually I am teaching this block of the month for our quilting guild and I do need to transport the blocks so they are pinned on there and ready to be toted around. But just so you know that normally my design wall is still on my floor although without flannel sheets. But either way you get the idea again. 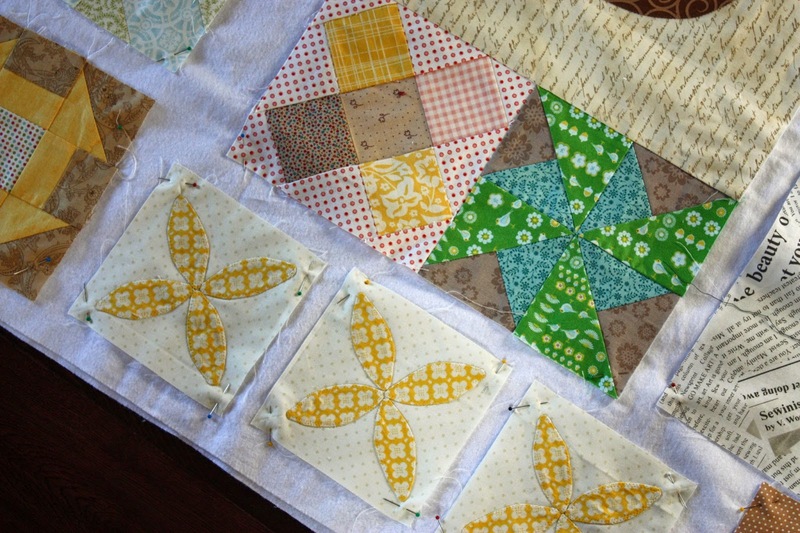 I really am enjoying parts of this quilt. There are some blocks that I really love and then there are some blocks that I really loved making. In some cases they might be in both categories. 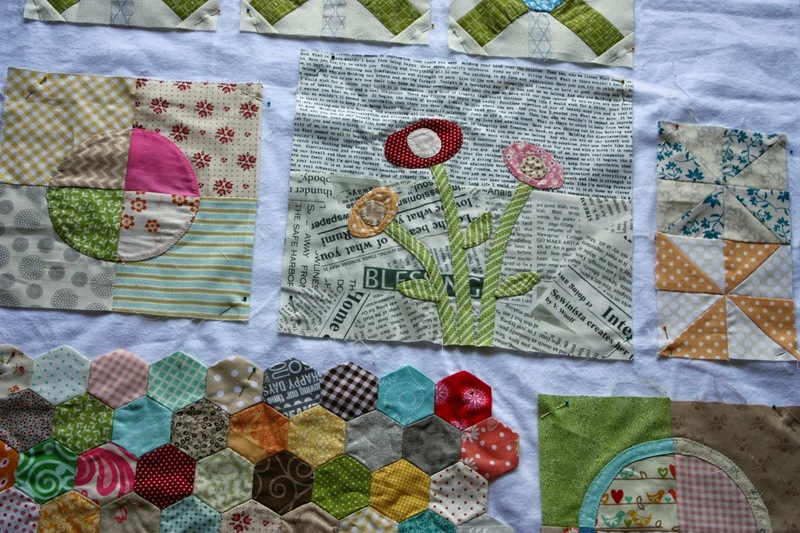 For now I will say the hexi block and the flower appliqué blocks on the newspaper print are in both categories. They are my favorite. I have a couple more blocks to finish before I am complete with the top half of the inner quilt. 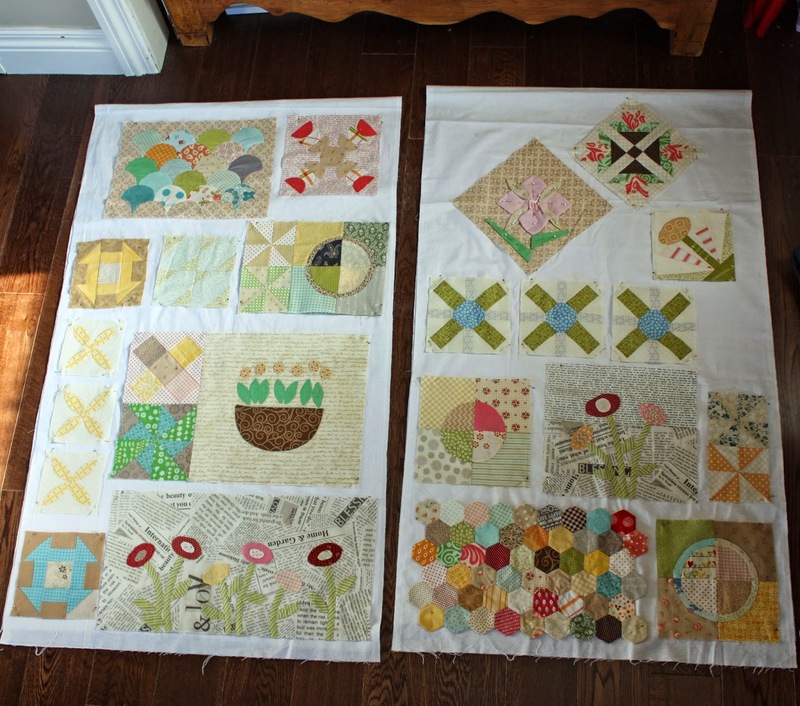 Also, there is one block that is doubled up because I am running out of flannel sheet room! See aren't the hexies and flowers cute? I know I am not getting a prize for my orange peel blocks but that is okay with me. Another project I made awhile back that I wanted to share because the fabrics kinda play on the block of the month fabric choices is a little bag I made. The only color that I am not using is the purple. This fabric is so cute though. I love the little hearts and swirls. It is randomly perfect. I have recently used cording for ties in a lot of the bags I have been making. It is so fun to mix it in. I originally bought it for clothing ties and I didn't even know if I was going to use it again. Crazy how when you have it you think "hey this would totally work in here". And then it does. That quilt is beautiful! I love your fabric choices/combos. You are really good at putting things together and making them look fabulous. Awesome, your progress looks amazing, and makes me want to catch back up! I really really love your color choices.